Parker! I want reasons! Reasons why that new deal Marvel/Sony did is good! And don't tell me it's because now Spider-Man can appear in the Marvel Cinematic Universe! I don't care about Spider-Man! He's a menace! He's a threat! He's a buffoon! Tell me some other reasons! 1. 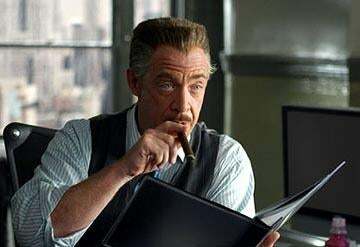 MCU J. Jonah Jameson. I mean, can you imagine it? Instead of using the New York Bulletin, they can use the Daily Bugle and, well, you. Can they get that Simmons guy that played me before? I'm sure they can, sir. 2. They can include Spider-Woman in the Avengers. Jessica Drew's rights were always nebulous - she wasn't associated with Spider-Man's origin, but she is still lumped in with the other Spider characters. But she has been a part of the Avengers for a while now and another female presence on the team couldn't hurt. Hmm, okay. 3. They can use Norman Osborn as a villain. The MCU has had a problem with creating interesting villains - outside of Loki, of course. Osborn could provide them with an interesting villain to use, especially if they make him the head of H.A.M.M.E.R. And they could use the storyline where the Daily Bugle is the one that outs him as the Goblin! We won a Pulitzer for that, man. 5. Miles Morales or Gwen Stacey as the new Spider-Man/Woman. Think about it, sir: instead of using, uh, the current Spider-Man (who is a white male, I am told), Marvel could use Miles Morales or Gwen Stacey. Morales has enormous popularity as the Ultimate universe Spider-Man and Gwen Stacey is just now gaining fans as an alternate reality Spider-Woman (referred to as "Spider-Gwen"). Both of those would be quite different from the previous five Spider-Man movies. I happened to like some of those movies. Of course, sir. Especially that third one with the dancing. Right. But you may be onto something, Parker. Thank you, sir. Now get out there and get me some pictures to accompany this article! Pictures of Spider-Man!